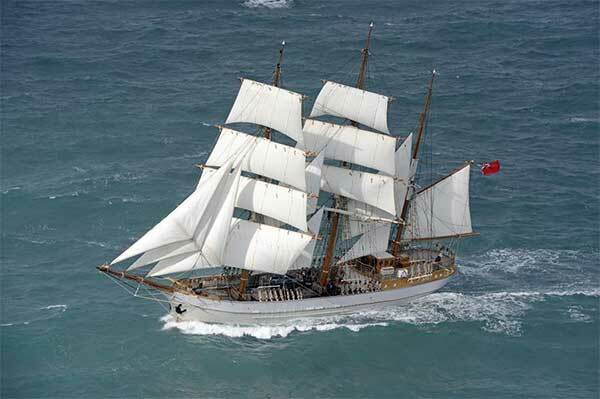 This September, Kaskelot's historic decks will be explored by thousands of visitors at TheYachtMarket.com Southampton Boat Show where she will star as a key attraction for the 10 days of the event. Moored alongside 330 of today’s most innovative sail and motor boats on the Show’s own stunning purpose-built marina, Kaskelot, with its knowledgeable crew and state-of-art restoration, will offer a treasure trove of stories and adventure for all visitors to explore as they step onboard this three-masted barque. One of the largest remaining wooden ships in commission, measuring 46.6m, she was built in Denmark in 1948 by the renowned J Ring Andersen Shipyard. She was commissioned by the Royal Greenland Trading Company and used to supply remote areas of Greenland until the 1960’s. After this, she became a fisheries support vessel in the Faroe Islands. Kaskelot provides the perfect backdrop for the appearance of celebrity pirate and star of hit CBeebies programme Swashbuckle, Gemma Hunt, at the Show on Saturday 16 September. She will be helping to kick off all the action on the first weekend, wowing the Show’s youngest visitors with a special pirate song and dance show, meet and greets and autograph signings.